"While you can’t control your sales team personality-wise, you can empower them with all the technology and tools necessary to make them better." Top sales representatives are like Liam Neeson in Taken: they have a particular set of skills and traits that set them apart, enabling them to perform at a level way above average. These reps are every sales manager’s dream, so what are the factors that separate them? For the most part, they apply specific practices in their day-to-day routine that make them unstoppable selling machines. Let’s take a look at these practices below. The majority of sales pitches usually center around the product or service the sales rep is selling, their company, or other information not directly connected to the potential customer. The difference between a good vs a great sales reps is that the later take their knowledge and expertise one step beyond the usual and learn all there is to know about the prospect: from the industry they’re in, demographics, geographical coverage, existing technological solutions, to everyday needs and responsibilities. Having a keen prospect understanding makes these sales reps more efficient than their colleagues. For example, some start their sales presentations with a simple briefing of the prospect’s business, providing them an opportunity to address focal issues right from the start. Whilst other sales reps have a tendency to talk prospects’ ears off with limited relevancy, the overachievers know how to properly position their solution, armed with much-needed business intelligence. Prospects must have the desire to work with your sales reps, meaning they bring special value to the table if they adopt a more advisory approach. Steve W. Martin, a noted sales researcher, calls this situational dominance, where the customer accepts recommendations and follows given advice. This is achieved by focusing on the entire sales process from the prospect’s perspective. Top sales reps not only know their company’s sales process inside and out, but they place special focus on the buying process and carefully lead prospects through every stage until they are ready to buy. Great reps realize not every prospect is in the right state of mind purchase-wise: some need more time to tinker with the demo, some need more nurturing, and some will take the bait as soon as it gets thrown to them. Sales people often jump too quickly on the opportunity to pitch their solution and close the deal but top performers possess the necessary patience and wait for the right moment. That’s not to say they don’t follow the company’s predefined sales process. But their focus on buyer’s needs is what helps them get through the finish line consistently. The ability to make changes on the fly is challenging, to say the least, but it’s also a sure-fire way to stand out amongst fierce competition. Those changes are perhaps nowhere near as frequent as in the tech market, where a freshly launched product here or a service can be a game changer, not to mention smaller things like updates, integrations, and so on that have the power to significantly alter the outlook of a solution. Knowing how to respond to a situation that’s considerably changed from the initial contact makes all the difference and top sales reps know it. That’s why they utilize all the technology and tools available to track their prospects in real time. Being up-to-date allows them to make necessary adjustments (last minute or not), displaying a high level of agility that’s one of the key factors in today’s dynamic sales environment. Selling to other business means locating and targeting the decision makers. While everyone knows dealing with those who have little to no power to buy your product or service is a waste of time, not every sales rep gets to speak with a decision-maker on the other end. There are two primary reasons for this: First, it’s much easier to get in touch with people other than the decision-makers themselves, and depending on the size of the business, there may be more people in the decision-making chain that need convincing. However, this doesn’t produce long-term results as the sales reps ultimately waste time on people with zero (or not enough) buying authority. Secondly, and more importantly, these sales reps don’t aim high up enough on the command chain. Top sales reps understand this and carry out significant research to target relevant position holders and make sure their pitch is both seen and heard by the right person. 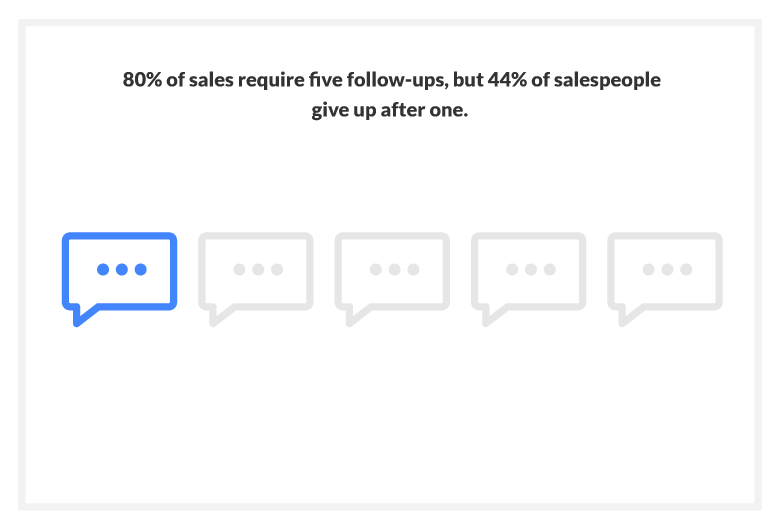 If there’s one thing sales reps are notoriously bad at, it’s a lack of following up. For fear of being annoying, salespeople try to play it safe and lay low, which is why almost half of them give up after the first try. Expecting the prospect to take the initiative and contact you is unrealistic. Top performers develop follow-up strategies that sometimes include a lot of follow-up calls and potential hassle but that’s exactly why they win at the end - their persistence shows just how serious they are about closing a deal without being overly aggressive. Furthermore, top sales reps always look to stay in touch with their customers for upsell opportunities. They realize a sale is far from a one-time deal, especially in the tech industry with all the updates, extensions, new features, and so on. Finding a way to always have your name in the client’s in mind not only ensures your business is first in line for additional sales but also prevents a competitor from edging you out. In the crowded and highly competitive landscape, SMB sales leaders have a fairly unique position to impact and empower their sales force to higher levels of sales. While you can’t control your sales team personality-wise, you can empower them with all the technology and tools necessary to make them better. Just because someone is lingering on average doesn’t mean they’ll never be the best. It’s your job to make that happen and now that you know what makes your top sales reps perform better, use it to drive success for the rest.